Strawberries are available year-round in California but the peak season is just approaching. As it gets closer and closer to April, the strawberries sold are becoming larger, redder, juicier, and they even smell sweeter. 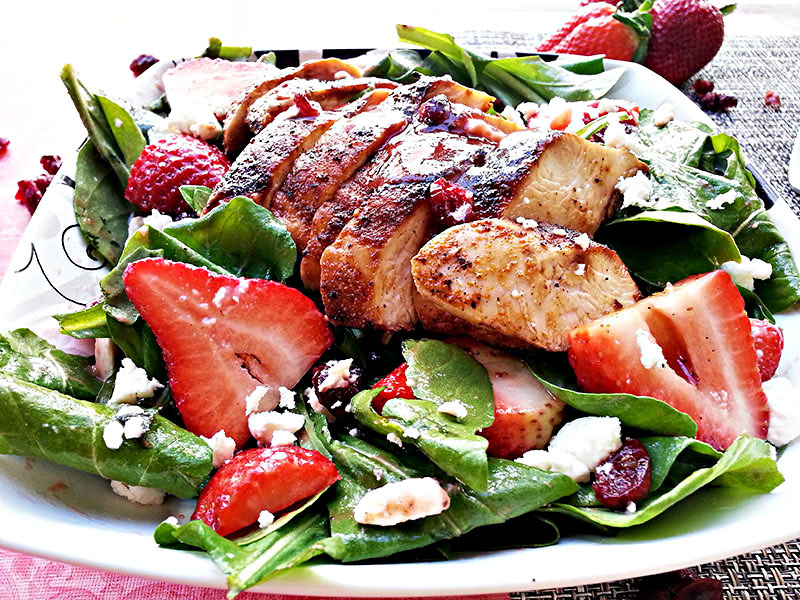 To welcome one of my favorite fruits into the season, I’m recreating a great blackened chicken and strawberry salad I had at the Alcove. 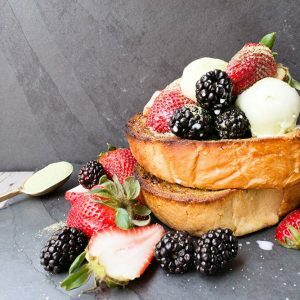 The Alcove is a local restaurant in Los Angeles that serves typical California cuisine with salads, sandwiches, and freshly baked goods. I’ve only been there once but after trying their salad, I can confidently say that I will be returning. Here is my take on their creation. Place strawberries, sugar and lemon juice in a medium saucepan. Heat over medium-high and bring to a boil. Reduce heat to simmer and cook until strawberries have softened about 5-8 minutes. Remove from heat. Transfer strawberries to a blender and puree until smooth. Strain the mixture. Cool. Whisk together the pureed strawberries with balsamic vinegar. Slowly add olive oil, whisking constantly. Season with salt and pepper. Set aside. 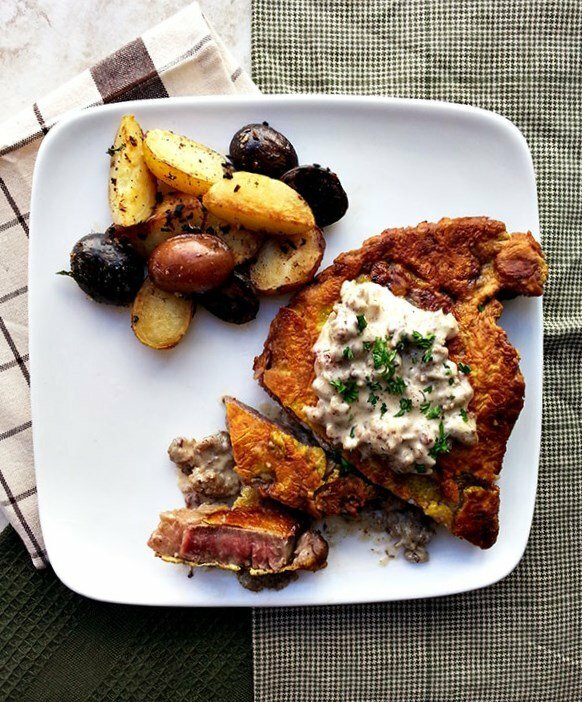 Combine seasoning for chicken from paprika - onion powder. Liberally sprinkle seasoning mixture onto both sides of the chicken. Heat oil in saute pan over medium-high heat. Add chicken and sear on both sides, about 1 minute on each side. Transfer to a baking sheet. Finish cooking chicken in the oven until juices run clear, about 10 minutes. Remove from heat and let cool 10 minutes before slicing. Toss together spinach with feta, sliced strawberries, cranberries, and salad dressing. Portion on four plates and top with sliced chicken. Serve. There are only a couple of ingredients in this salad, but each one serves its purpose. 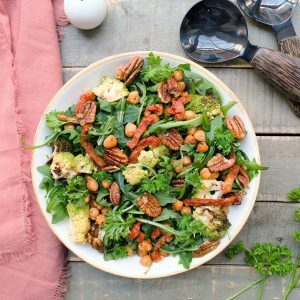 You can substitute the chicken for salmon, shrimp, steak or even tofu and this salad will still be great. 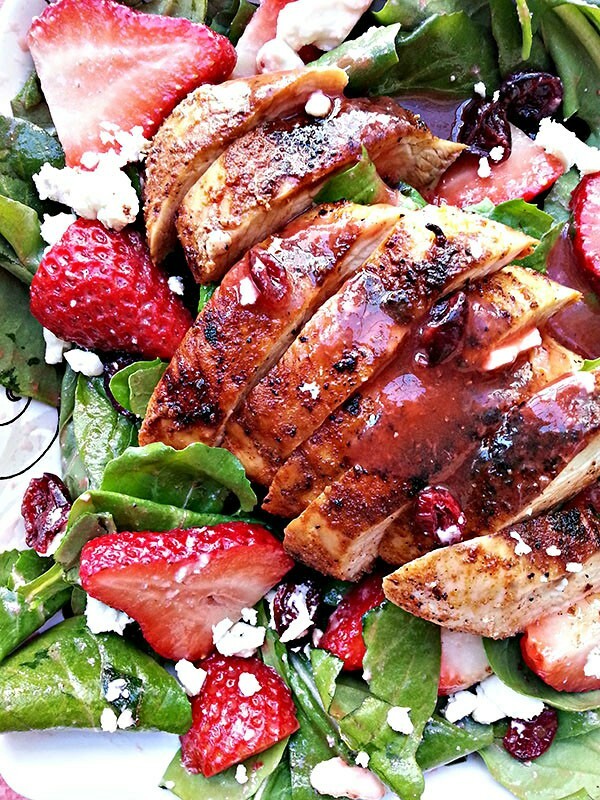 For the vinaigrette, use fresh strawberries to really make them shine in the salad. The sweet strawberries with the tangy balsamic vinegar is a great combination, as is almost every fruit with balsamic vinegar! Toss all the ingredients together and serve. I can have this salad every day and not get bored of it. 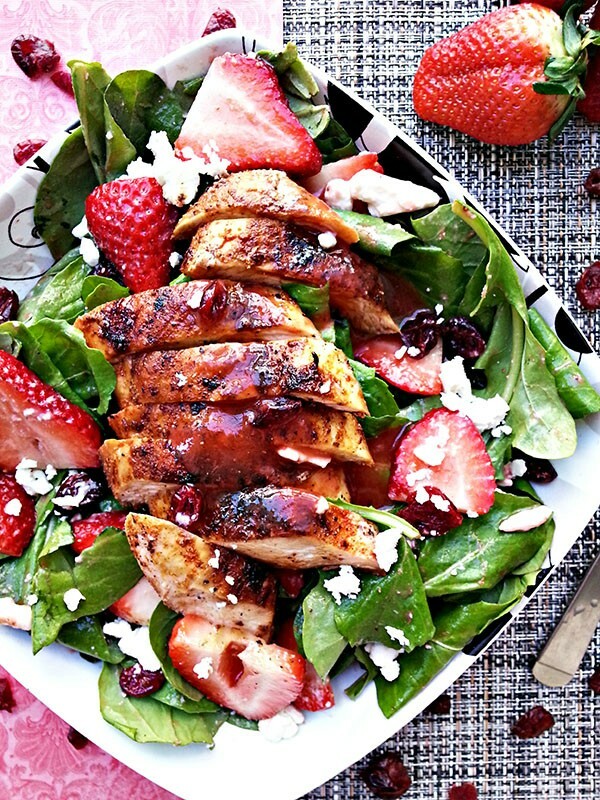 The combination of sweet cranberries with the slightly tart strawberries, creamy feta, and savory chicken is heavenly. Fortunately, strawberries are available here in California so I can make this year-round! Can I make a reservation for dinner at YOUR house? Love this salad!! Saying hi from CCN! Lovely post - the photos, the salad, the details. Great job. I am in love with year round berries in California. Feel so spoiled. I love making a vinaigrette with them with balsamic. For some fun variation sometime, buy a bottle of pomegranate molasses at a Middle Eastern market and sub it in for the balsamic. it's thicker but the flavor is a great alternative. Gosh, this is such a beautiful salad!! I love all the colors and flavors! My husband would love me even more if I made this for him - he loves salads like this! Thanks for the recipe! Definitely a man-approved salad :) Enjoy! This was so amazing, even my boyfriend who never wants to eat salad loved it!! Always a plus when you can make one meal for you and your man! can you make the dressing ahead of time, like a day? Then refrigerate? Can you substitute a different cheese-maybe goat cheese? All these different flavors don't seem like they work together but they do. I cut up the chicken and pit it in the salad, it was so amazing. Thanks for sharing.